I sit in the bar of a fabulous restaurant converted from a 16th Century jail in Estremoz and sip the remainder of my wine. I don’t want to finish it! But even I won’t succumb to a second glass. After all, it’s just 2 pm! Gregg is at a meeting with the director of the local museum. The director included a piece of Gregg’s in a show a few years back and so Gregg is meeting with him now to perhaps discuss opportunities for further shows. I sure wouldn’t object to coming back here for another visit. I’m hooked on the Alentejo! This converted jail/restaurant is just around the corner from the castle keep and the posada and down a few stairs. Whitewashed walls, round arches, heavy stone lintels, and black bars on the windows remind the well heeled customers of what the space once held. 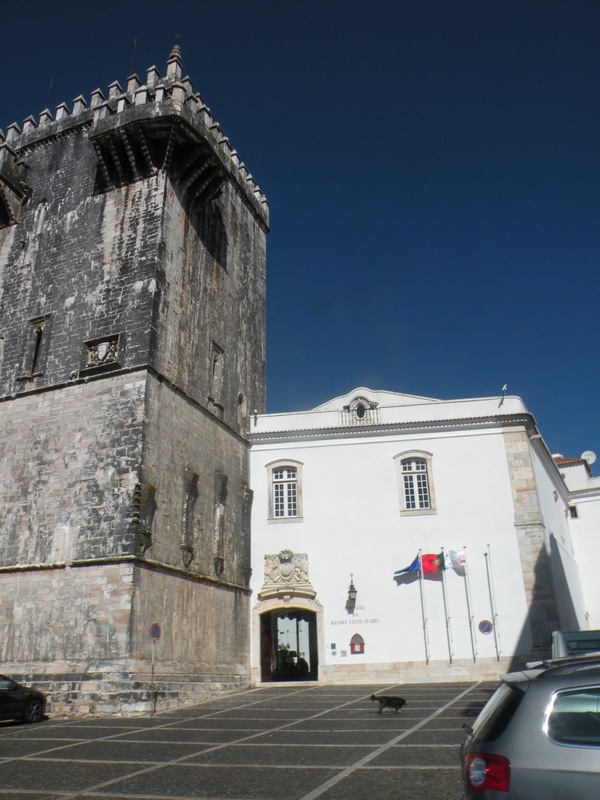 Built in the 16th Century, the jail housed the bad ‘uns of Estremoz. 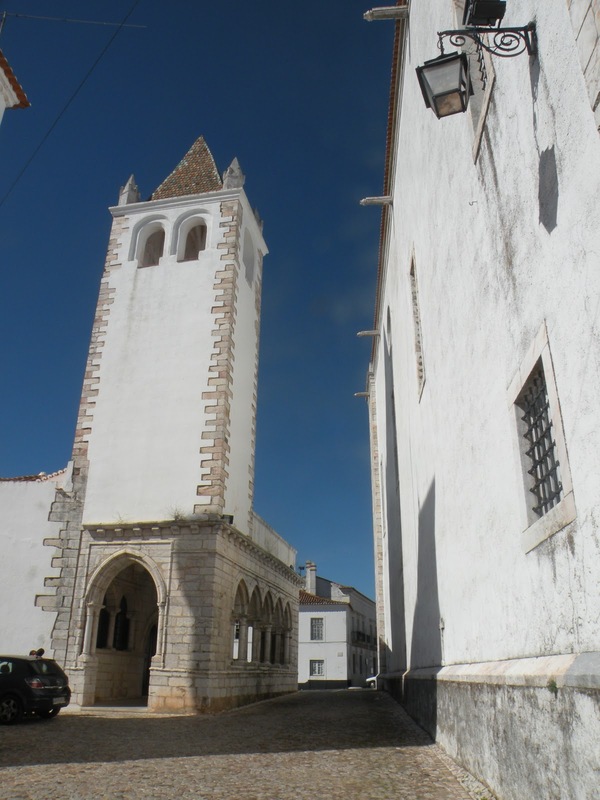 One wonders how many baddies there could have been back then since even today Estremoz is pretty tiny. The restaurant caters obviously to the gourmet tourist trade. 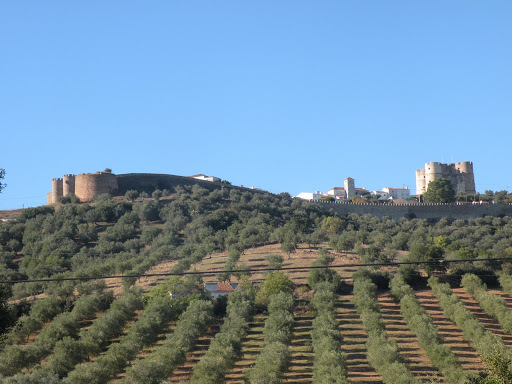 I think that’s a common theme in this part of the Alentejo of Portugal. Very well-heeled gourmands from around Europe flock here to taste the local wines and indulge their palates. The emphasis is on local, very fresh ingredients put together with herbs indigenous to the region – rosemary and coriander appear frequently. We chose to order the couverte and three amuse-bouches. What a lunch! The couverte consisted of a long thin white dish of green olives sprinkled with lemon, two tiny amuse-bouches each, little rolls of fresh butter, and a huge basket of breads. The waiter brought the breads around a few times – we could choose from various types of toast and slabs of local bread. The slices of local bread I chose were chewy and sweet—unlike any bread I’ve ever tasted. The crusts were very hard and chewy. They defeated Gregg but I enjoyed the crunch. The slabs of toast I tried were crunchy and again slightly sweet. Slathered with a knife full of creamy white butter turned them into morsels of ambrosia. The phrase toast and butter will never be the same. Two mini amuse bouches were brought as part of our couverte. The first was a spoonful of cheese wedges drenched in fig syrup with sprigs of rosemary—an amazing taste combination of salty and sweet. The other spoonful was some kind of sausage pieces – hearty and salty and utterly delicious. For our main course we had chosen three appetizers (also called amuse-bouches). I like the phrase amuse-bouches – fun for the mouth! On the recommendation of the very friendly waitress, we chose baked cheese, mushroom and herb stew, and grilled sausages. Mon dieu! I felt like I was in one of those gourmet TV food shows. Each mouthful of all three dishes had us swooning. The baked cheese was melty and salty and tangy and smooth. I slathered it over a piece of the hearty local bread and had to mute my sighs of pleasure in case I disturbed the other diners. The mushroom and herb stew was actually served cold (it was supposed to be) and was an interesting combination of sun dried tomato sauce, coriander, and lovely meaty mushrooms. Occasionally a spoonful of the cold mushroom stew swirled into the hot grilled cheese to provide yet another taste sensation. The piece de resistance was the long, very thin white serving dish the width of a sausage filled with diagonal slices of the most amazing grilled sausage I have yet to taste in this life. Indescribably salty with a hint of char around the edges. My stomach is still reeling. I washed the whole lunch down with a huge glass of red (tinhto) wine from the region. So far I have tasted three Alentejo wines and all three have been spectacular. They are full bodied but not over-powering. I can’t think of any wines I’ve had that are similar. They are not as strong as the Tuscan brunellos and yet they are not light like a chianti. I’m no wine expert and so don’t have the correct terms. Suffice it to say that each mouthful of these Alentejo wines is smooth and chewy and, well, really red! I could get pretty addicted to this stuff! It tastes of the land and the history of this arid region. As I finally sipped my last mouthful of the wine, Gregg and the director arrived and whisked me away. The director wanted to show Gregg another exhibition space in the center of town. He drove us down and showed us just a lovely space filled at the moment with a wonderful exhibit of drawings by Portuguese artists. Gregg will be submitting a proposal to the museum and if it’s accepted, we may be able to come back for an exhibition in 2012! The director told us that the region is starting to be touted as the new Tuscany and I can see why. It has all the ingredients — lovely hilltop towns with castles and fabulous hotels, gourmet restaurants, wineries, endlessly gorgeous scenery, and lots and lots of sun. It’s also quite a bit more reasonable than Tuscany. I wouldn’t say it was cheap, at least in our experience, but the hotel and restaurants were definitely excellent value. Our gourmet dinner in Evora cost about 50 euros including a half bottle of wine and three courses. I doubt we’d get the same at home for $75 all inclusive (no HST and extra service here!). 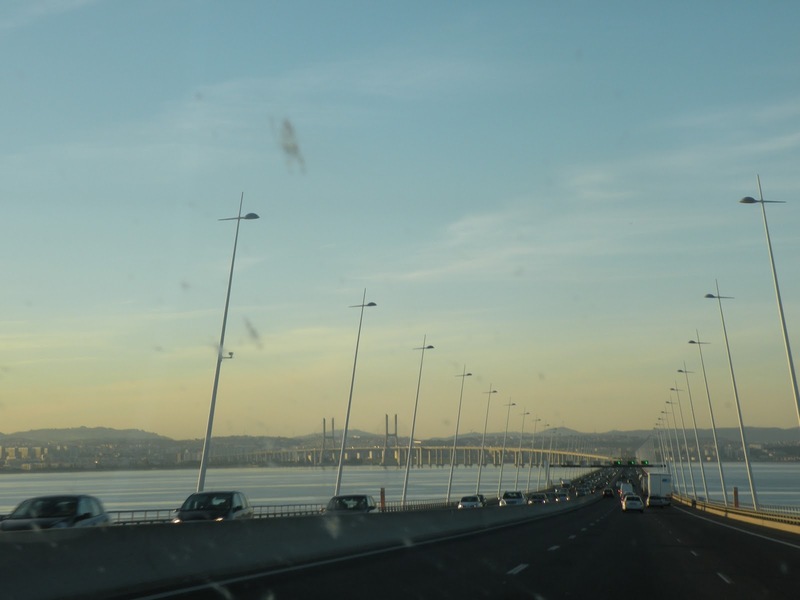 So after bidding farewell to the director, we hopped back in the car and enjoyed a sun drenched late afternoon drive back to Lisbon on a freeway that was basically empty. We’re not sure where all the cars have gone, although we were told that tourism is down thanks to far fewer Americans traveling. It’s certainly true that the vast majority of tourists we’ve encountered have been European. It was great to come back to our lovely apartment in Lisbon to relax. We have just five days left before we fly home. I plan to spend most of the remaining time doing some more writing and finishing off a bit of sightseeing. We’ll also try to take in another fado performance and find a few more restaurants. We were given some good recommendations while in Evora.